Both alfalfa and corn have relatively high demands for sulfur that must be met if optimum yields of either crop are to be realized. By now, most growers are familiar with the undisputed success of the Clean Air Act of 1970 and the significant reduction in the amount of sulfur now present in precipitation. With less sulfur being applied to crop fields through rainfall and snow, monitoring crop sulfur status has become a more important aspect of crop production. 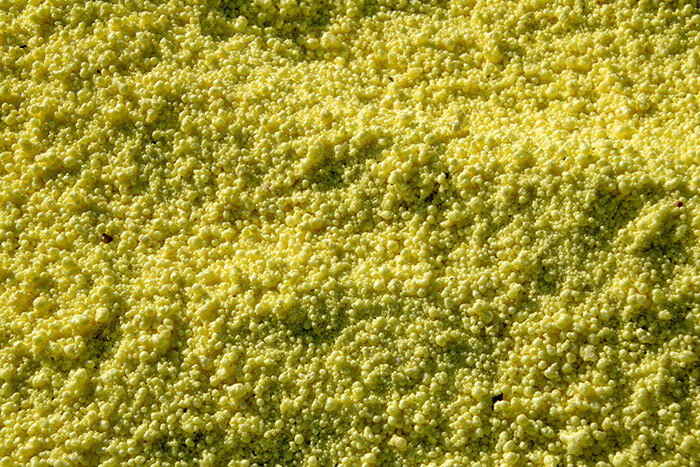 In many cases, sulfur has become a routine component of many fertilizer programs for both alfalfa and corn, especially where fields don’t receive regular applications of manure. “Selecting the right source of sulfur is critical to ensure enough sulfate-sulfur is present in the soil at key uptake periods,” says Dan Kaiser, nutrient management specialist with the University of Minnesota. In a recent Minnesota Crop News Blog, Kaiser explains that sulfate sources such as ammonium, potassium, and calcium sulfate provide a readily available source of sulfur to a crop. However, he also notes that the sulfate form of sulfur is subject to leaching. Like nitrates, leaching is more pronounced on coarse-textured soils. One option that some growers turn to is application of elemental sulfur. Where elemental sulfur is preferred, an initial application will need to be supplemented with additional sulfate-sulfur for near-term benefit. The elemental sulfur will eventually be made available to subsequent crops. Kaiser cautions to be wary of claims that some sources of elemental sulfur have better availability. “The primary mechanism to make elemental sulfur available to crops is controlled by climate, which can lead to unexpected deficiencies (if you assume immediate availability),” Kaiser says. The best method to check for sulfur sufficiency in a crop is to perform a plant tissue test.